Backstage was just as exciting as the runway show! Bobbi Brown led the makeup, and to go along with the "Punk Rock Garden Party" theme they featured variations of purple on the eyes, lips and checks on flawless, healthy looking skin. All the models looked pretty yet edgy…perfect for the collection. The nails were led by the talented Miss Pop using Ciate polish. Miss Pop decided on three different nail looks based on the designs. The edgy stripes are an exact swatch match to one of the gorgeous fabrics in the Emerson Spring 2014 collection. Everyone is a sucker for stripes -- especially a twisted version in black and white! To amp up the rock vibe of the collection, she added a matte top coat and pierced each middle finger with a safety pin. 1. Pain on a coat of Underwear base coat and two coats of Snow Virgin. 2. Dunk a thin nail art striper brush in Unrestricted Glam and stroke a few times up and down on the nail to create a jagged line through the center of the nail. 3. Repeat step 2 to the left and to the right, creating three jagged lines on each nail. 4. Allow a few minuets for your look to set, then seal it with topcoat. 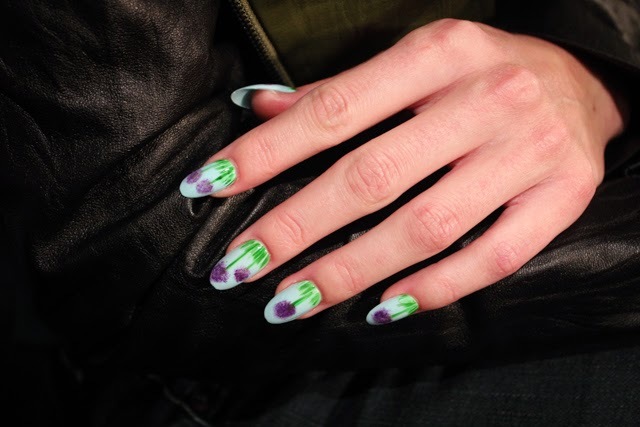 This nail look was Miss Pop's interpretation of spring -- clear blue skies over a field of fluffy purple Allium flowers. 1. Apply Underwear base coat and two coats of Ferris Wheel to you nails. Allow a few minuets for the polish to dry. 2. Using a thin nail art striper brush, stroke vertically along the edge of the nail with Palm Tree to little short lines that look like grass. 3. Then, use a nail art striper and make longer strokes to create the stems of the Alliums. If there's more than one Allium on a nail, be sure to stagger the height of these lines. 4. Highlight the grass and stem with Stiletto to add depth to the field greens. 5. Using a filbert paintbrush or an old eye shadow brush, tap little light purple balls at the end of the stems with Spinning Tea Cup. They should be so soft and light, you should see little dots where the brush hairs place the paint. So, you might need to dab excess polish off your brush before painting the flowers on the nail. 6. Rinse you brush off in acetone or nail polish remover. Repeat step 4, going over those same little floofy balls with Talent Scout. 7. Allow a few minutes for you look to set and then seal it with topcoat. This nail look is an abstraction of the models walking down the runway at Mercedes-Benz Fashion Week in their spring floral Emerson gowns -- a row of colorful characters blazing a path through the deep purple darkness of the excited, assembled cross. Between the multi-colored streaks are little gaps to show small peaks of the natural nail, a nod to the trend. 2. Take out a plastic palette or lid. Pour a couple drops of Spinning Tea Cup out. Then, using a thin paintbrush, swipe horizontal stripes up the center of the nail. You only need to cover about 40% percent of the nail width-wise with each stroke. 3. Repeat step 2 with Talent Scout, Raspberry Collins and Palm Tree, leaving little gaps between some of the strokes so the natural nail can peak through. 4. Using the bottlebrush, stroke up the left and the right side of the nail, leaving a wide stripe of the multi-color accent through the center of the nail. Paint each nail like this twice to add two top coats of Talent Scout. 5. Allow a few minutes for your look to set and then seal it with topcoat. The hair was led by Prive and they decided on smooth wavy hair with a knotted twist and purple flowers to compliment the collection.